Workplace accidents happen. However, when your workplace is multiple stories above the ground—as is the case for many roofing professionals—injuries can be much more severe. For this reason, special safeguards are needed to protect rooftop workers and minimize accidents and injuries. The Occupational Safety and Health Administration (OSHA) has fall protection regulations in place that all construction workplaces must meet. These requirements are designed to prevent workers from falling off overhead platforms or elevated workspaces, and compliance often requires purpose-built equipment. 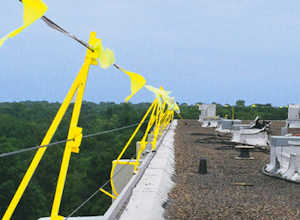 To ensure your roofing employees are safe, we’ve put together the following checklist of commercial roofing fall-protection equipment. Warning line systems use stands and flag lines to visibly warn workers that they are approaching an unprotected side or edge (i.e. there is no wall or guardrail system in use). By roping off dangerous areas, employees can work unrestricted within the designated perimeter, and the job site remains OSHA compliant. If workers need to move outside the confined area, they must be protected from fall hazards with a guardrail, personal fall arrest system, or safety net. Guardrails are barriers erected along roof edges, perimeters or walkways to prevent workers from falling to lower levels. OSHA requires that guardrails be able to withstand at least “200 pounds of force applied within two inches of the top edge, in any direction and at any point along the edge,” as well as 150 pounds of force along the midrail. Fall protection carts are personal fall arrest systems that offer mobile anchorage for contractors when doing leading-edge work. Essentially, workers wear body belts or harnesses that are connected to the cart using a lanyard. The cart is then moved with the worker around the roof edge, preventing the individual from falling and/or safely stopping them if they are already falling. Lanyards are flexible lines that connect “the body belt or harness to a deceleration device, lifeline or anchorage,” according to OSHA. When built with shock absorbers, the force of stopping is greatly decreased, as the line expands to absorb energy. Similar to lanyards, lifelines are flexible ropes that connect to an anchor. They can either be vertical (connected to the anchorage at one end) or horizontal (connected at both ends). OSHA requires that lifelines have a minimum breaking strength of 5,000 pounds. For more information on fall-protection safety equipment, contact a Hy-Tech Products representative at 800.635.0384.